Support Us – Willy's Kitty Angels Rescue, Inc.
Willy's Kitty Angels Rescue, Inc.
We Rely on Your Generous Donations! We are a 501(c)(3) charitable organization, EIN 26-3359404. All the contributions are tax deductible No good or services will be provided in exchange for the contribution. We rely on the generosity of individuals, community groups, and businesses to cover the costs of food, toys, litter, formula, and other rescue related supplies. 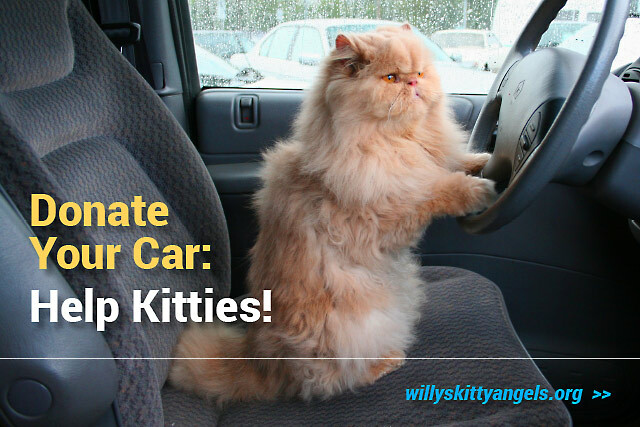 Donate your car today through V-Dac and turn your old car, RV, or truck into a tax deductible donation that could do wonders for our kitties and cats! Thank you in advance!